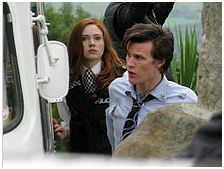 Then new season of Doctor Who is scheduled to air on BBC America April 17, 2010. This season will start with the Matt Smith doctor with Steven Moffat as the head writer. I can't wait to see how Matt Smith does. I'm expecting a more physically delivered performance from him based on the small sample of him as the Doctor at the end of The End of Time. Older PostSF News Bites: Green Lantern Movie Begins Filming, Sharktopus Syfy Original Movie?